Eleanor aged 10, from Birmingham, had 'Acquired Dysgraphia', and found it difficult to write and to organise her excellent ideas into a well constructed story. The results of her psychological assessment, undertaken by Dr Peter Condon at the Gifted Children's Centre, showed her to be in the intellectually, gifted range of intelligence, and mildly dyslexic. Eleanor could write at the top speed for her age group. A very poor standard of handwriting had transferred into long term memory. Three consecutive class teachers had tried to improve her handwriting but had failed. Her teachers were not aware that pupils who can write at speed, who have lots of ideas racing through their mind, would be unable to pay attention to the mechanical production of writing because the handwriting style had become automatic. Continual practice does not always help, as many parents have discovered. For pupils like Eleanor (gifted children), who write at speed, should be taught a cursive writing style (joined letters) as soon possible at the primary stage of education. This approach is accepted practice in Austria, America and France. 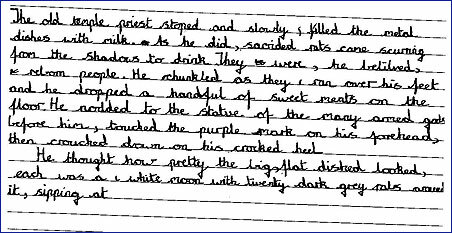 Eleanor's 'After' sample of handwriting shows that she achieved a lovely, fluid cursive style in one week, and was beginning to concentrate much more on spelling accuracyl, without any spelling tuition having taken place. 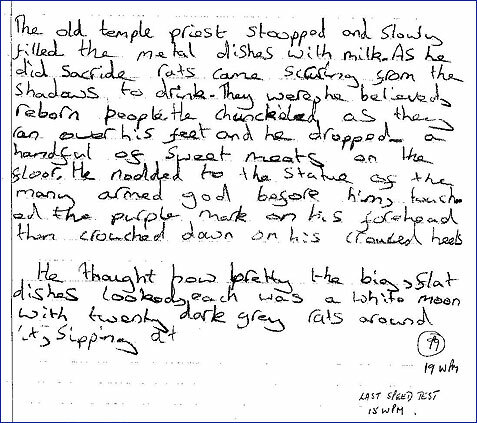 This spelling improvement occurred because although Eleanor could write at speed mechanically, the daily, repetitive writing practice for developing a prescriptive handwriting style, which follows a rigid, sequenced approach, appears to aid memory. This concentrated training seems to move attention from the need to recall spellings by a progression of letters - to an ability to recall syllables and diphthongs. It appears to be the only logical explanation.